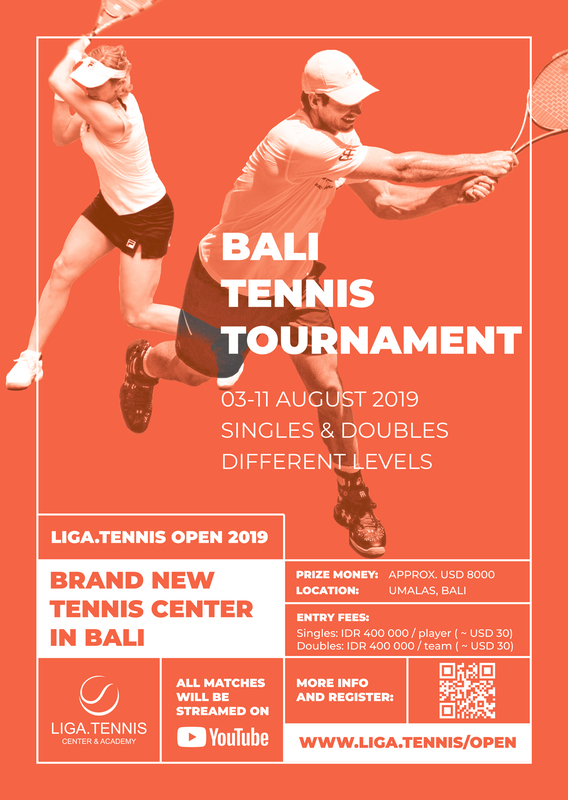 Welcome to our inaugural tournament - Liga.Tennis Open 2019 which will be held from August, 03rd-11th in Bali. Our event is open for all levels of competitive players, with various categories to accommodate players from club to international level. We are on track to attract more than 300 players to join including confirmed groups from various countries. All matches will be streamed on Youtube and the Liga.Tennis app and we anticipate a large audience to attend big matches. Like an ATP or WTA tournament, we will be holding on-court interviews for selected matches! Come join us at our amazing new facilities at the Liga.Tennis Open! To register in Liga.Tennis Open 2019 you should press "Join" button on this page. Total - IDR 6.000.000 (~ USD 450). 12. Consolation Women's Amateur Singles. Notes. For Kids & Juniors - a separate tournament will be created and announced later. Prizes to be announced later. Singles: IDR 400 000 / player (~ USD 30). Doubles: IDR 400 000 / team (~ USD 30). All participants will be requested to pay an entry fee after 01.05.2019.